Supercomputers can do everything from solving medical mysteries to predicting where oil spills will hit next. Now, thanks to some Department of Energy handiwork, they can also save billions of gallons of fuel. The Department of Energy’s Oak Ridge National Laboratory (ORNL) and BMI Corporation recently used ORNL’s Jaguar supercomputer–the fastest supercomputer in the country–to design technology to make semi trucks more energy efficient. 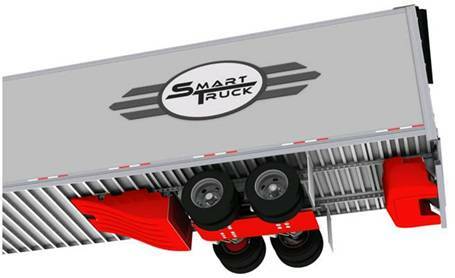 100,000 times more powerful than a typical home laptop, to build a SmartTruck UnderTray System for trucks. The system consists of fairings–or, shells around the outside of the vehicle–that improve the aerodynamics of 18-wheeler trucks. According to the DOE, Jaguar cut down on the computing turnaround time for BMI’s SmartTruck models so much that the company was able to go from concept to manufacture-ready design in 18 months. Originally, BMI anticipated that the project would take three and a half years. gallons of diesel fuel ($5 billion in costs) and cut CO2 emissions by 16.4 million tons. Not bad work for a computer.